Something about them really speaks to me. I think it's the connection with a real live, breathing human who placed his or her hand against the cool stone and blew pigment over it to leave these stencil prints so very long ago. 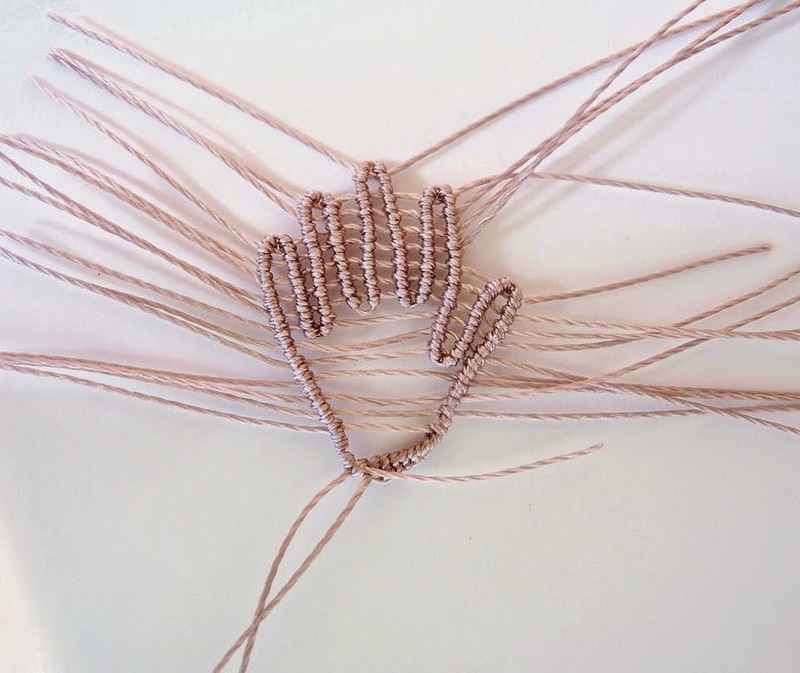 I wanted to knot hand outlines and then surround them with random free form macrame in a wide cuff, but when my first experiment with knotting a hand print turned out looking like an alien hand, I decided to rethink that strategy. I still think there's potential for this concept, but it is going to take a lot more tweaking and I ran out of time. (Making a mental note to come back to this at a later date.) Then I thought I could adapt the idea a bit and make a sort of freeform necklace with handprint charms. I spent days researching until I found the perfect charms. 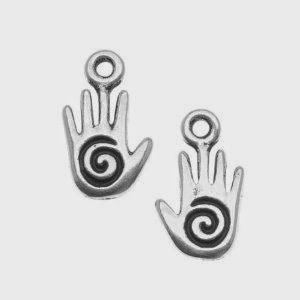 I liked these because they would hang right-side-up in my design and I thought the spiral had a sort of cave painting vibe. And then that project didn't happen, either. By this time I'm a week away from the reveal and I have nothing to show. Luckily I had done some other shopping. I had some components on the back burner and this piece from Star Spirit Studio really appealed to me. 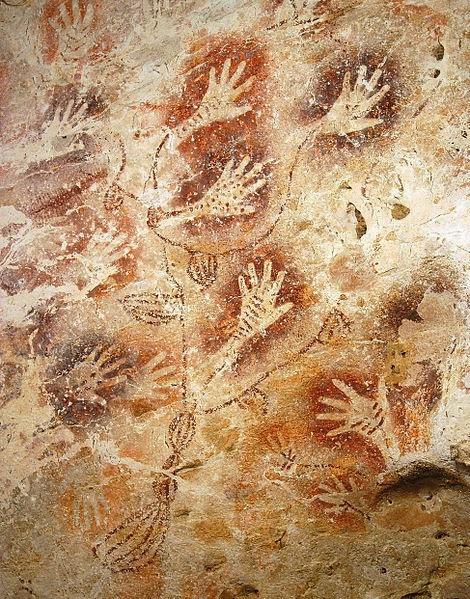 It has the handprint and a horse drawing that would look good on any cave wall, and absolutely gorgeous colors, too. How lucky you had that pendant laying around in your stash - it was perfect! I was somewhat inspired by that photo as well! I love love love your necklace! Love your necklace. Caveman Chic - and that is is my friend. I love the work of Star Spirit and use it often. This is a beautiful pendant - love the design of the bail. Great job. This post gave me a much-needed laugh this morning - your description the target cave woman is just great! And truly, that horse drawing would look great on any cave wall, haha. Your piece is beautiful too. I love that it feels reminiscent of early human times, yet is still sophisticated and modern enough to wear today. 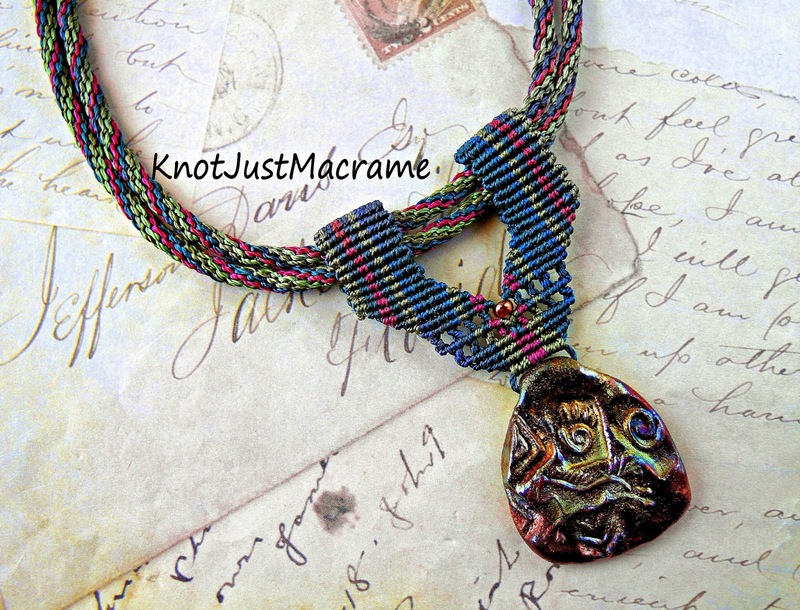 And how in the world those nylon cord colors so perfectly match the colors and sheen of raku is beyond me! P.S. I like the hand you knotted! Great necklace, I love the Caveman chic style! Beautiful! I love the piece from Star Spirit! Sue is such an amazing artist and interesting lady! Very interesting raku piece - its perfect for this! You r description was hysterical!